A last-ditch bid to halt the clearance of the UK's largest illegal travellers' site, at Dale Farm in Essex, has been rejected by an appeal judge. He refused to allow a challenge to an earlier High Court ruling which denied the travellers a temporary injunction to stop their eviction. Basildon Council has said the removal of travellers from the site at Crays Hill will begin on Monday. Another application to stop the eviction will be made the same day. Medical evidence relating to sick and vulnerable Dale Farm residents was heard at the High Court. Resident Mary Flynn, 72, who suffers breathing problems and uses an electric nebuliser, has been the crucial protagonist in the High Court battle. Refusing her application for the injunction on 31 August, Mr Justice Kenneth Parker said the only aspect which gave him some concern was medical evidence received detailing a significant deterioration in her condition. The judge was told by lawyers for Basildon Council, which is in charge of the clearance operations, that this fresh material would be considered before proceeding against her. A spokesman for the Judicial Office raised the possibility of a renewed application to appeal, but said no stay had been granted so far to halt the clearance. Later the Judicial Office announced Mrs Flynn was renewing her last-ditch application at an oral hearing in open court on Monday before Lord Justice Pill. In an open letter to residents of Dale Farm delivered on Thursday, council leader Tony Ball said violence and law-breaking would not be in anyone's interest. Travellers and supporters have said they will resist peacefully. The planned eviction follows a decade-long row over unauthorised plots. 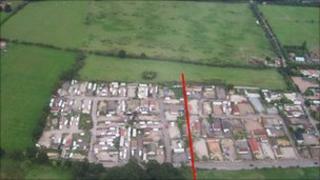 Up to 400 people are thought to live on the 51 unauthorised plots and travellers insist many will remain. But small numbers have begun leaving the site ahead of the start of the clearance operation. Dale Farm: Where can the travellers go?